To date, the main cardiovascular application of TDI (tissue Doppler imaging) has been in myocardial evaluation. 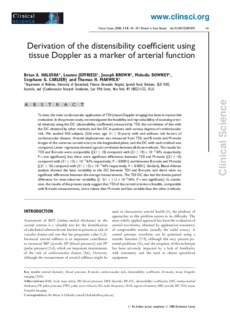 In the present study, we investigated the feasibility and reproducibility of assessing arterial elasticity using the DC (distensibility coefficient) measured by TDI, the correlation of this with the DC obtained by other methods and the DC in patients with various degrees of cardiovascular risk. We studied 450 subjects (256 men; age, 51 ± 10 years) with and without risk factors of cardiovascular disease. Arterial displacement was measured from TDI, and B-mode and M-mode images of the common carotid artery in the longitudinal plane, and the DC with each method was compared. Linear regression showed a good correlation between all three methods. The results for TDI and B-mode were comparable [(21 ± 10) compared with (21 ± 10) × 10-3/kPa respectively; P = not significant], but there were significant differences between TDI and M-mode [(21 ± 10) compared with (31 ± 13) × 10-3/kPa respectively; P < 0.0001] and between B-mode and M-mode [(21 ± 10) compared with (31 ± 13) × 10-3/kPa respectively; P < 0.0001]. Similarly, Bland-Altman analysis showed the least variability in the DC between TDI and B-mode, and there were no significant differences between the average measurements. The TDI DC also had the lowest paired difference for inter-observer variability [(-0.1 ± 1.1) × 10-3/kPa; P = not significant]. In conclusion, the results of the present study suggest that TDI of the carotid arteries is feasible, comparable with B-mode measurements, more robust than M-mode and less variable than the other methods.